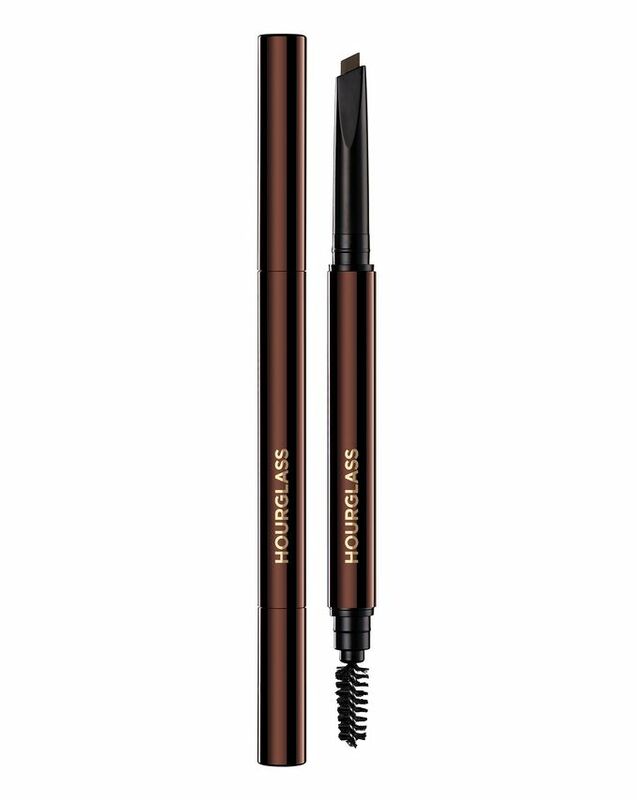 Get immaculate arches in one easy step with Hourglass’ Arch Brow Sculpting Pencil, a mechanical brow pencil that combines the benefits of powder, pencil and wax formulations to create natural-looking definition. The secret to this pencil’s success? The unique triangular shape, which allows you to sculpt with broad strokes using the flat edge of the pencil, as well as fill in fine lines using the pointed tip, to create the illusion of fullness without looking obvious. The sleek, double-ended tool features a spoolie at one end for effortless grooming and blending, while the buildable pencil end comes in nine versatile shades to flatter and enhance your hair colour. From light, cool ‘Platinum Blonde’ to dark brown ‘Natural Black’, via medium brown to deep red ‘Auburn’, there’s one to flatter every pair of brows out there. 1. Twist up slightly until the product reveals itself. 2. Define your brow shape by using the pencil to outline your desired brow shape using the wider edge of the pencil. 3. Fill in any sparse areas to even out your brow using small strokes. 4. Use the brush on the other end to groom and blend brows in place. Is it expensive? Sure. However, it does last a lot longer than other pencils I've used in the past (double the time, if not more), so I feel like in the grand scheme of things I'm might be spending less when using this one - currently on my third one in about a year and a half. I have oily, sensitive skin, and this one lasts on me all day long - 14+ hours (I do set it with the ABH clear gel). It looks really natural - and when you have sparse brows, having that wider tip helps me go through my brow routine really quickly in the morning. Good quality, nice packaging. But ash blond unfortunately is not so ashy. It has a neutral undertone, not cool undertone. And for me it’s quite a dark colour. I can’t say it’s very long lasting. On me it lasts about 4-5 hours. You can’t draw tiny strokes with this pencil, as its tip is rather big. Good if you have a heavy hand! Stay away from this if you like soft and pigmented brow products! I have quite thick eyebrows and a heavy hand, so this is perfect for me as it gives me just enough control and it does not leave my eyebrows overly filled out. Amazing if you want a more natural look! I have been using this eyebrow pencil for years and never found anything that came close. The colours are superb, the pencil itself is pigmented but not too much and it's actually quite stiff to use, but that makes sure you don’t end up with Instabrows (unless you want that look of course).